It’s been a really long time since I updated. So sorry about that. Straight after exams, I left for my family holiday (read all about it at Midi & me) and haven’t really had time to bake/update since I came back. I totally procrastinated on that 12 days of Christmas thing and have decided to put it off. On Saturday, I had a bake sale with one of my lovely NUS Biz girls, Joanna. It was pretty nice to have most of our stuff sold out. Thanks for the support if you came down to get some sweet treats for yourself. I’ll do an update on that at a later time. Today was ZY’s niece’s birthday. 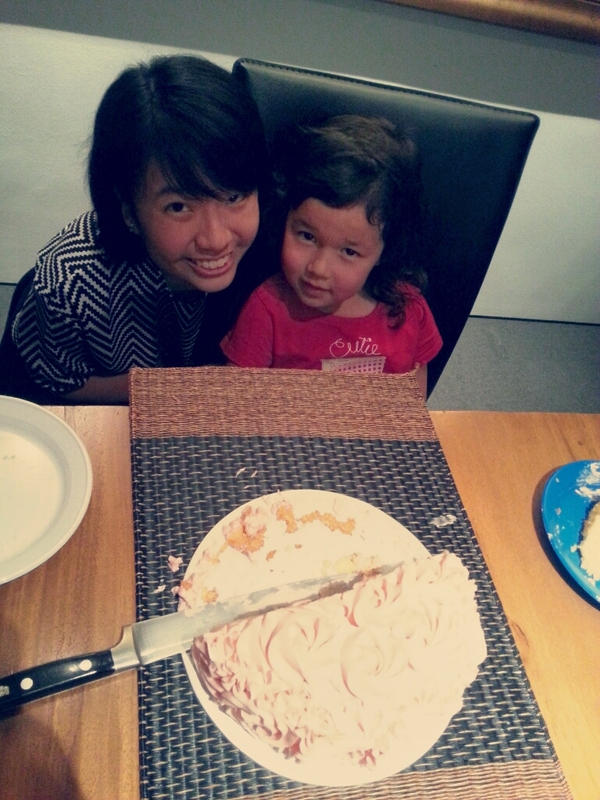 She told me a few months back that she wanted a flower cake and showed me one of a rosette cake. Since I had time this afternoon and haven’t made a rosette cake before, I decided to try it. The cake was a lovely orange sponge recipe that I got off The Straits Times. I highly recommend this because it’s something really light and fragrant. Freshly squeezed orange juice and zest, you can’t really go wrong with it! 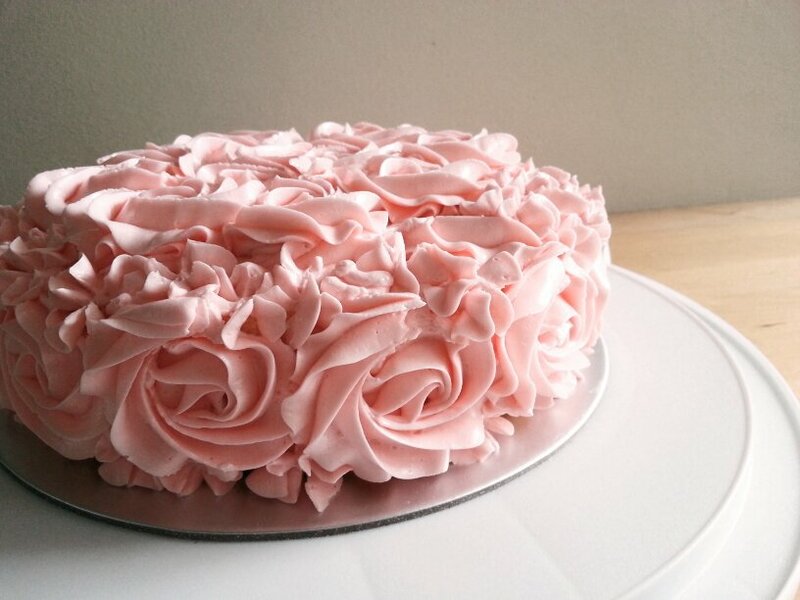 I used my favourite Swiss Meringue Buttercream recipe which holds really well in Singapore’s hot weather. Overall, I was really pleased with how the cake turned out. The birthday girl and all the family members loved it too. If you wish not to frost the cake, the orange sponge tastes lovely on its own with a cup of tea. Do not grease the pan or your cake will not be able to stick to the sides and, will fail. Your buttercream may curdle. Keep whipping. This is what happened to my buttercream but after a minute, it whipped to perfection. A belated Merry Christmas to all my loyal readers & an early Happy New Year! This is so lovely! 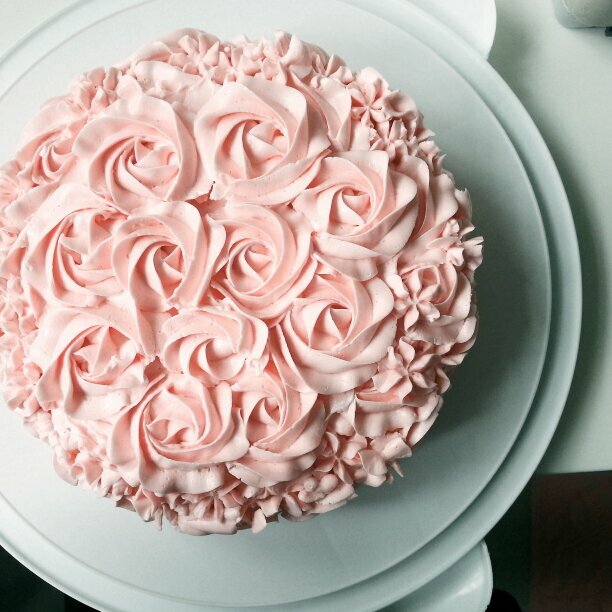 Do you have a tutorial on how to make the rose flowers with the frosting? If you know how to pipe rosette cupcakes, this should be pretty easy. If you like though, I can post a tutorial on how to do the rosette design. I’m no expert but I’ll try my best!